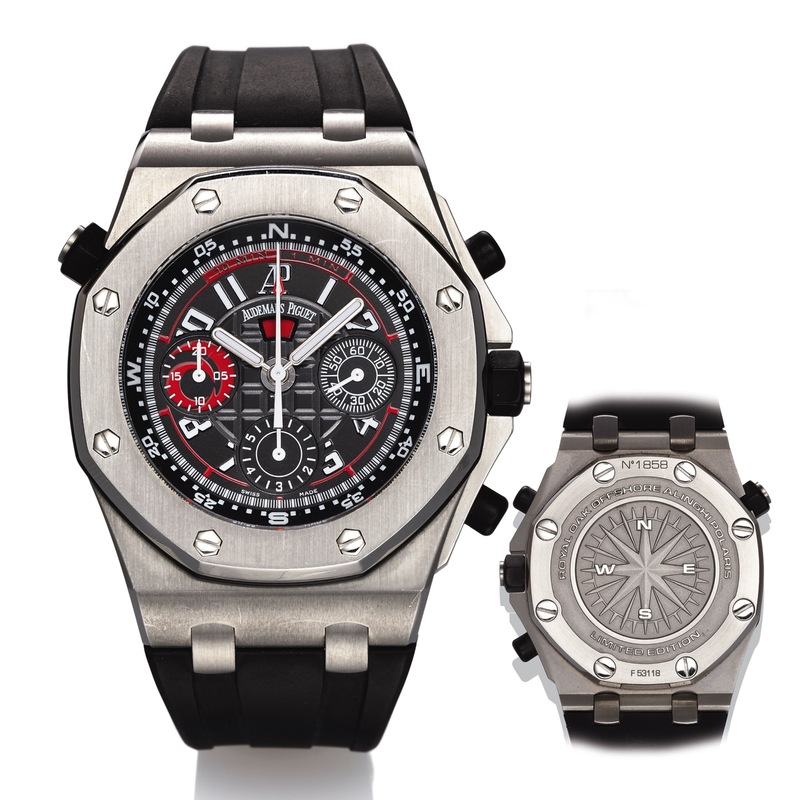 AUDEMARS PIGUET ROYAL OAK ALINGHI POLARIS STEEL Audemars Piguet, Royal Oak Offshore Alinghi Polaris, No. 1858, case No. F53118. Made in a limited edition of 2000 pieces in 2006. Very fine and unusual, large, tonneau-shaped, octagonal bezel, self-winding, water-resistant, stainless steel wristwatch with round button fly-back chronograph, "Regatta" function, registers, inner revolving navigation ring and a stainless steel Audemars Piguet deployant clasp. Three-body, polished and brushed, case back with limited edition dedication and central conmpass rose secured by 8 screws, polished and brushed octagonal bezel secured with 8 hexagonal bolts, buttons and screw-down crown with rubber cap, screw-down crown at 10 position to rotate the inner navigation ring, sapphire crystal. Black, inner clous de Paris decoration, luminous radial Arabic numerals, subsidiary dials for the seconds, the 6-hour and 20- minute (with red Alinghi logo) registers, inner red central progressive 10 minute count-down scale, outer minute/seconds track, outermost bi-directional revolving navigation ring, aperture for the black/red "Regatta" countdown function. Luminous white gold baton hands, luminous red arrow hand for the 10 minutes count-down timer. Cal. 2326/2847, rhodium-plated, oeil-de-perdrix and fausses cotes decoration, 50 jewels, straight- line lever escapement, monometallic balance adjusted to heat, cold, isochronism and 5 positions, shock absorber, self-compensating flat balance spring, 21K gold rotor segment. C. Three-body, polished and brushed, case back with limited edition dedication and central conmpass rose secured by 8 screws, polished and brushed octagonal bezel secured with 8 hexagonal bolts, buttons and screw-down crown with rubber cap, screw-down crown at 10 position to rotate the inner navigation ring, sapphire crystal. D. Black, inner clous de Paris decoration, luminous radial Arabic numerals, subsidiary dials for the seconds, the 6-hour and 20- minute (with red Alinghi logo) registers, inner red central progressive 10 minute count-down scale, outer minute/seconds track, outermost bi-directional revolving navigation ring, aperture for the black/red "Regatta" countdown function. Luminous white gold baton hands, luminous red arrow hand for the 10 minutes count-down timer. M. Cal. 2326/2847, rhodium-plated, oeil-de-perdrix and fausses cotes decoration, 50 jewels, straight- line lever escapement, monometallic balance adjusted to heat, cold, isochronism and 5 positions, shock absorber, self-compensating flat balance spring, 21K gold rotor segment. Dial, case and movement signed. DIM. 42mm. THICKNESS 15 mm. Launched at SIHH in 2005, the AP ALINGHI POLARIS, named after the star commonly used for navigation, was the first ROYAL OAK designed specifically for sailing. Using a newly designed Calibre 2326 movement with Cal.2874 chronograph module, the watch featured a flyback chronograph with visual 10-minute countdown timer as well as 20 minute and 6 hour registers, with a subsidiary dial for running seconds. Released in a limited edition series of 2000 examples with 1935 in this configuration, the model was the first, and until 2016 the only, Royal Oak model to incorporate an inner revolving ring as found on the Scuba model (also first launched in 2005) with a chronograph.